Derek Jarman has been called the 'godfather' of the early 1990s cinematic movement now known as 'Queer Cinema'. 'Queer' rejects labels, challenges fixed ideas of gender and sexual identity and refuses the status of a tolerated minority, and queer imagery dominates Jarman's cinema. Yet there has been little attention given to this rich vein in his work.This is the first book to view Jarman's uniquely personal - and pleasurable - cinema through the analytical prism of 'queer'. Niall Richardson takes up queer theory and its debates, as well as the tension between theory and activism, to apply these issues to Jarman's cinema in critical readings of his films, with special attention given to "Caravaggio", "Edward II" and "Blue". Richardson enters the debates about queer sexuality and particularly the dynamics of sadomasochism in sexual relations. He considers alternative regimes of gender and sexuality, desire and its relationship to the body, and the political impact of such images. Although Jarman's films have often been praised for being allegories of political resistance, this book argues convincingly that the 'queer' status of his cinema is as much indebted to the representation of alternative paradigms of gender and sexuality as it is to his portrayal of tendentious political battles. Derek Jarman has been called the 'godfather' of the early 1990s cinematic movement now known as 'Queer Cinema'. 'Queer' rejects labels, challenges fixed ideas of gender and sexual identity and refuses the status of a tolerated minority, and queer imagery dominates Jarman's cinema. Yet there has been little attention given to this rich vein in his work.This is the first book to view Jarman's uniquely personal - and pleasurable - cinema through the analytical prism of 'queer'. Niall Richardson takes up queer theory and its debates, as well as the tension between theory and activism, to apply these issues to Jarman's cinema in critical readings of his films, with special attention given to "Caravaggio", "Edward II" and "Blue". Richardson enters the debates about queer sexuality and particularly the dynamics of sadomasochism in sexual relations. He considers alternative regimes of gender and sexuality, desire and its relationship to the body, and the political impact of such images. 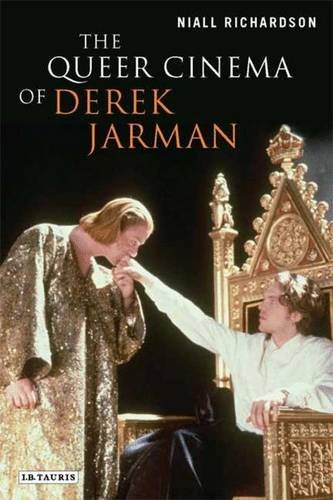 Although Jarman's films have often been praised for being allegories of political resistance, this book argues convincingly that the 'queer' status of his cinema is as much indebted to the representation of alternative paradigms of gender and sexuality as it is to his portrayal of tendentious political battles.